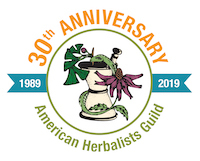 The American Herbalists Guild is pleased to release our newly expanded and revised Code of Ethics. Communication and community have perhaps never been more important in herbalism, yet in these days of social media and digital communications and heated political and philosophical divides there is an increasing need to be transparent and explicit with our values and ethics. Ackowledgement of the Code of Ethics will be obligatory for all AHG members, employees, councilors, volunteers, committee members and attendees. The intention of this Code of Ethics is to encourage conduct that creates a safer and more intentional space. It also allows us to take action in cases where there are grievances. But most importantly, it puts our values and ethics are the forefront of our interactions and activities as an organization. This is a living document, and while many parties contributed to its creation and vetting, there is always room to grow and adapt. We encourage our members to let us know their thoughts and suggestions. We hope this will be a step in continuing to nurture a thoughtful and intentional AHG community.